28th October, Tamuning: Former PBA, Purvis Granger of the Philippines, bagged the 6th Guam International Open by outclassing third-seed, Brian Manibusan of Guam, 254-189 in the title match at Central Lanes Sunday evening. The champion, who was the second runner-up in the Chinese Taipei Open early this month, made amends and did not let the title slipped his hands as he cruised to a convincing victory. Granger had earlier topped the second block finals with 3582 ahead of fist block leader, Ricky Duenas of Guam in second on 3544. In the first stepladder match amongst fourth-seed, Jonathan Duenas of Guam, fifth-seed Sixto Sengson of the Philippines and sixth-seed, Jay Leon Guerrero of Guam, Guerrero took the match with 215 to defeat Duenas and Sengson, who scored 207 and 170. But Guerrero was no match for third-seed and fellow compatriot, Brian Manibusan. Manibusan easily won the second match to knock out second-seed, Ricky Duenas and Guerrero with a superb 268 whilst Ricky Duenas and Guerrero managed only 148 and 178 respectively. In the title match against top-seed Granger, Manibusan could not repeat the form he showed in the second match to go down to the Amercian and had to settle for second. In yesterday's first block finals, Ricky Duenas topped the field of 30 finalists with 1848, just 5 pins ahead of Granger in second with 1843. Brian Manibusan took third spot with 1836 with JD Castro and Jonathan Duenas rounding up the top 6. The field was cut to the top 16 moving into today's second block. 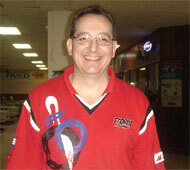 Granger was richer by US$4,000 for winning the title with Manibusan taking home US$2,000 and Ricky Duenas US$1,000. 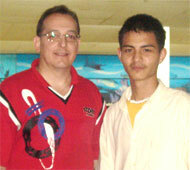 Photos by Joey Miranda III, Guam Bowling Congress.